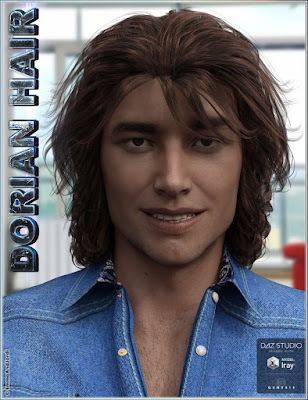 Our new product for our Daz 3D store is a Daz Original: Dorian Hair for Genesis 3 Male(s), a very versatile medium curly hair that will look great in any male character that you can imagine. With 41 morphs in 8 categories, freedom to move and adjust it, stylize it with more or less volume, and 20 hair colors, Dorian Hair is a must have! And don't miss the sale: our store is 40% off today, and if you get Dorian Hair or a new release, you will get 60% on our store, and a free Base Figure. Hurry!! Our new product for our Daz 3D store: EJ Barbara For Genesis 3 Female. She can be a warrioress, an amazingly beautiful woman of our times, or the mysterious protagonist of a sword and sorcery tale or legend. Barbara is perfect for any theme. A must have! Barbara is a very versatile character for Genesis 3 Female, with lots of features that you can use to get many different looks: two bodies (one more muscular, one more slender), unique facial features, stilletto nails, long squared nails, fangs, two special eyes, four special fantasy makeups, and tattoos that you can put where you like. A must have! 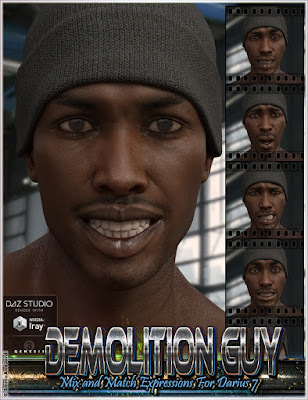 Our new product for our Daz store is released: Demolition Guy is a pack of expressions organized in three folders (Full Face, Upper Face, and Lower Face) for Darius 7 And Genesis 3 Male(s), and you also have pose control ERC dials to apply each full face expression. So Beautiful is a pack of expressions organized in three folders (Full Face, Upper Face, and Lower Face) for Monique 7 And Genesis 3 Female(s), and you also have pose control ERC dials to apply each full face expression, and you can mix them all.